Loved this book. Read and re-read it many years ago. Might read it again soon. The final quote could have come from Miss Lonelyhearts! Thanks for your kind mention Jacqui! You’re very welcome, Jose. I must head over to yours to have a proper read of your review. I knew you’d posted on it, but I’d been trying to avoid other posts until now. Great review Jacqui. I *love* Hammett so it’s odd that I’ve never read any Chandler! What wonderful titles he has. I love the sadness of Chandler under all that hardboiled sass. You see the world with quite different eyes when you put the book down, and it lasts. Just to say the name of the book brings the feeling back. Impossible to read those quotes without hearing Bogart’s voice in my head! I feel the same way! Marlowe is and always will be Bogart (in my mind anyway). There’s a film adaptation of The Long Good-bye (relocated to the 1970s) with Elliot Gould as Marlowe, and I just can’t imagine it! I should give it a watch though as it was directed by Robert Altman, and I’m a fan of his other work. My mind was screaming ‘heresy’ until I saw the Altman’s name. Still not sure I could bring myself to watch it, though. I completely agree… I always see Bogart when I read about Marlowe. Interestingly enough, I have never read any of the books. At some point, I will remedy that. It’s funny how these characters can become inextricably linked with one particular actor even when several different players have tried their hand at the role. I would definitely recommend the novels – it’s worth trying one just to see how you get on with Chandler. Either The Long Good-bye or The Big Sleep, perhaps (as it’s the first in the series)? Robert Mitchum was a good Marlowe, too. He did at least two movies in the role. He did at least two movies in the role. He did exactly two movies in the role. I’d agree (as noted above) that he was excellent in Farewell, My Lovely (1975), but he seemed tired and/or bored and/or just a tad over the hill in The Big Sleep (1978). Love Raymond Chandler and haven’t read any for AGES ! Well, you know me, Helen – I need a fix of this stuff every now and again. Seriously though, Chandler does make a refreshing change from other types of fiction. I can thoroughly recommend this one (even as a reread). 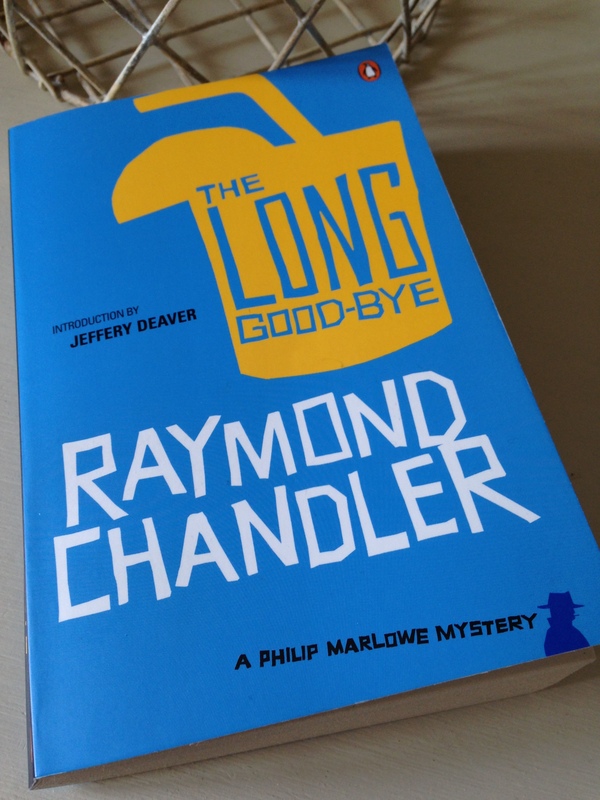 This is definitely my favourite Raymond Chandler book – probably because it was the first I read as a teenager. Somewhere I still have that old battered ex-library book that opened up a whole new world of crime to me – so very different to the Agatha Christie I’d read before. How wonderful. He opened up a whole new kind of crime writing for me too – such dynamic prose, I got totally caught up in Chandler and Marlowe’s world. I’m glad you enjoyed this one. I have been meaning to read some of the Chandler books for a long time but I have not done so yet. I guess one can say that these are the template for a certain kind of literature that I really want to explore. I agree that the writing style of the passages that you quote is superb. Terrific commentary as always Jacqui. Thanks, Brian. The prose is terrific, isn’t it? The Big Sleep is full of zingers, those sharp one-liners, but if anything the writing feels more balanced here. I guess the Marlowe novels (along with Dashiell Hammett’s work in the 1930s) set the template for this kind of fiction. (I’ve also been reading Ross Macdonald’s Lew Archer novels, and they’re definitely worth a look too.) They do consider the darker side of human behaviour, but there’s a value in exploring this as a means of understanding some of humanity’s failings. This is a subject of interest to you, I think? And there’s some light to balance the darkness…I had a lot of sympathy for Marlowe in this one. I’ve never been interested in crime novels and whodunnits but I think I should try some Chandler at least. I think I should also read some James Bond & Agatha Christie…I don’t know when though. Oh yes, do try some Chandler. He’s such a wonderful prose stylist. Funnily enough, I think the social critique and commentary in The Long Good-bye might be of interest to you. This would be a good one for you to try as it feels like Chandler at his most interesting. The Altman/Gould adaptation is very much worth a look. Gould gets a bit irritating at times, as his wont, but the movie has many strengths to compensate. It offers a new and welcome way of looking at the novel, I think. Thanks, John! I was hoping you might drop by with some thoughts on the Altman/Gould adaptation amongst other things (as always, your comments are most welcome). I’m an Altman fan, and the shift to the ’70s is a fresh way of approaching the novel so I’ll have to chase it down. See this is exactly what I’m talking about. There are so many classic/vintage crime novels I need to catch up on. Chandler’s prose is like a drug: one has to have it sometimes. This one is terrific. I see above the recommendation for the Altman film, an adaptation I did not especially like. It is something – and I agree with realthog that it is certainly worth watching – but it is not Chandler. There’s a meanness in it that just doesn’t exist in The Long Good-Bye, and while I’ve seen it at least twice, I still cannot get used to Elliot Gould as Marlowe. I always feel like I’m there on the set when watching that film, annoying aware that there are other things going on beyond where the camera is pointed. I guess that’s very Altman, come to think of it. Definitely. I need a fix every now and again. That’s interesting about the Altman film. I’ll give it a try (and it’s good to know you think it’s worth watching), but your comments echo my own reservations about the idea of Elliott Gould as Marlowe. I loved the novel; there’s a wistful quality to it, you can see it that final quote…I didn’t see the meanness either. The activity-beyond-the-camera thing is very Altman! I feel the same way about Nashville even though it’s one of my favourite Altman films. He’s still one of my favourite authors and this is one of my all time favourite books. I’m glad I don’t see Bogart when I read him. Don’t get me wrong, I like Bogart very much but Marlowe is one of a kind. I love that character. I wish I could have a drink with him. Chandler’s terrific, isn’t he? I’m so glad to hear that this is one of your favorite books. It feels like Chandler at his most interesting, and I loved the wistful melancholy tone in the closing sections. It’s funny, isn’t it? Having watched the film adaptation of The Big Sleep, I can’t read these novels without picturing Bogart as Marlowe! I’d love to have a drink with him too. It would have to be bourbon (or a gimlet for The Long Good-bye). I love Chandler. I’m particularly fond of the way he keeps Marlowe’s voice so world-weary and cynical and yet shows him behaving really rather tenderly towards anyone who he believes is truly down on his or her luck. It makes him such an appealing character. And the prose is completely delicious. Have you read Benjamin Black’s continuation novel? It’s the only one of the many, many continuation novels out there that actually works. Exactly! That’s what I love about him too, an irresistible combination of qualities. I haven’t read the Benjamin Black, but you’re the second person to recommend it to me! I usually steer clear of these homages, but I’ll take a look at the Black. I’m also interested in Ariel Winter’s trilogy The Twenty-Year Death, the second volume of which is Chandleresque in style (or so I’ve heard). I don’t know if you’ve read it, but it comes highly recommended. I read The Big Sleep years and years ago, when I read how Raymond Chandler influenced the modern Robert B. Parker. There was a time when I read and reread everything Parker wrote, couldn’t get enough of the wit, the dialogue, and his hero, Spencer. I don’t remember The Big Sleep enough to comment well, but you have inspired me to pick up The Long Good-Bye. I love a good detective, a rugged truth seeker who puts things right. It’s interesting how one writer can lead to the discovery of another, someone whose work has made a deep impression on a favourite author. Another commenter got in touch with me on twitter to say she has wanted to read Chandler ever she learned that he was one of Murakami’s favourite writers (and I know how much you love Haruki M’s work!). I haven’t read Ted Lewis but I love the film Get Carter, so there’s a good chance I’d enjoy the books too. It sounds as if you have a treat in store there. I hope you get around to reading the Long Good-bye at some point, it’s a great novel. It’s too long since I’ve read Chandler … I read them all too long ago and must re-read – especially this one. Although that opening paragraph of The Big Sleep finishing with “I was neat, clean, shaved, and sober, and I didn’t care who knew it. I was everything the well-dressed private detective ought to be. I was calling on four million dollars.” has stayed with me. This one is definitely worth rereading, Annabel. It’s just so satisfying on more than one level – not just a great hard-boiled novel, but a sharp critique of the corruption at play too. Fantastic review! I’ve wanted to continue my Chandler reading for quite some time but haven’t been able to. I read The Big Sleep a couple of years ago and loved every page and every word, and much like you I love Chandler’s style, his prose is evocative and Marlowe is the quintessential hardboiled character. What a style! It strikes me every time I read posts about Chandler. I haven’t read this one but I sure want to. Thanks for all the quotes, it really gives a good idea of Chandler’s style. The description of the blond entering the bar is a marvel. PS : About LA: have you read John Fante? He is the business when it comes to the hardboiled novel, such a great prose stylist. I love that blonde-walking-into-a-bar quote too. In my other life (or dreams), I would be a film noir femme fatale, the Lauren Bacall type a la Vivian Sternwood from Chandler’s The Big Sleep. The Long Good-bye is fantastic. It’s more interesting than some of Chandler’s earlier novels, I think. Less reliant on one-liners, too. It’s as if he’s fully confident in his style and this grounding allows him to use the novel to explore some more ambitious territory. I think you’d really enjoy it, Emma. No, I haven’t read John Fante. You’re a fan I take it…do you have a recommendation? I’d recommend The Road to Los Angeles or Ask the Dust. Billets on my blog, reviews at Max’s too. Who “translated” this book, Jacqui? Chandler wouldn’t have spelled “tires” as “tyres” in that last quote, after all! :D I like all of Chandler, but I have a distant (and perhaps faulty) memory of this being ambitious but not as strong a novel as his first two. Your review and in particular the quotes you highlighted make me eager to reread Chandler in general and this novel in particular to find out how accurate that memory was. Great stuff! Haha! Clearly I’ve got the English edition (just checked my copy and it’s definitely “tyres”!). It’s years since I’ve read Chandler. Such good prose. Is this the third of the Marlowe’s? In film to me he’s Bogart, but I have the Mitchum Farewell my Lovely (haven’t watched it yet) and as actors go he does sound like he’d fit. I definitely echo the Fante recommendation. Lovely review Jacqui. Chandler’s so quotable isn’t he? Thanks, Max – yes, eminently quotable! You should go back to him at some point – I would love to read you on Chandler. I’ve enjoyed revisiting a few of them over the past couple of years. This is actually the sixth in the series, so I skipped ahead simply because The Long Good-bye was fairly close to hand at the time. I guess I ought to go back and fill in the gaps – maybe I’ll reread another later in the year. I’m not sure if I’ve ever seen the Mitchum version of Farewell, My Lovely – you’ll have to let me know what you think once you’ve watched it. Powell is good in the original version (Murder, My Sweet), but I can’t erase Bogart from my mind, probably because The Big Sleep was the first Chandler adaptation I ever saw. He remains the definitive Marlowe for me as well. I ended up buying a Fante off the back of Emma’s recommendation, Ask The Dust, which I suspect you may have read? I’m looking forward to it. Sorry for the slow reply. I have read Ask the Dust and loved it. There’s a review at mine if you’re curious. I think you’ll like it. No need to apologise, Max – we’ve all got busy lives. Great, I’ll take a look at that review.